What Progress Has Been Made in Space Nuclear Power and Propulsion? For those who are interested in the exploration and development of space by humans, nuclear propulsion technology is a very attractive option. Why? Compared with the best chemical rockets, nuclear propulsion systems (NPS's) are more reliable and flexible for long-distance missions, and can achieve a desired space mission at a lower cost. The reason for these advantages in a nutshell is that NPS's can get "more miles per gallon" than a chemical rockets. If NPS's were analogous to a 1998 Honda Civic, then your best chemical rocket would be a gas-guzzler from the 1950's. What is the trip time? Do we want to return? What is the mass of the payload we want to send there (and bring back)? Upon answering these questions, one can proceed to determine approximately what the propellant requirements are using the rocket equation: delta-V = vexhaust*log(Minitial/Mfinal). The delta-V is an equivalent velocity change that depends on the destination, travel time, trajectory, gravitational force field, and the thrust mode for a given space mission. Vexhaust is the exhaust velocity of propellant coming the rocket engine; Minitial is the initial mass of the rocket vehicle, and Mfinal is the final mass of the rocket vehicle. The propellant used to achieve the mission is simply Mpropellant = Minitial-Mfinal. A higher exhaust velocity is desired, because less propellant will be required for a given space mission. A performance parameter that rocket engineers like to use is the specific impulse (Isp) which is simply the ratio of the thrust to the weight consumption rate of propellant (Isp = F / ( dm/dt * g) = vexhaust / g , g=9.81 m/s2) So, for example, if you have an engine with a specific impulse of 500 seconds, that means you have an exhaust velocity of 4905 m/s and your engine will produce 500 pounds of force for every pound of propellant it consumes per second. Figure 1 shows a plot of the mass ratio (Minitial / Mfinal) for various mission delta-V's and specific impulses. It is pretty clear from this diagram that a high specific impulse is desired to minimize the propellant requirements. The specific impulse, Isp, is a rocket engine's equivalent of an automobile's "miles per gallon" rating. In chemical rocket engines1,2, such as the Space Shuttle Main Engine (SSME), the chemical reaction between the hydrogen and oxygen releases heat which raises the combustion gases (steam and excess hydrogen gas) up to high temperatures (3000-4000 K). These hot gases are then accelerated through a thermodynamic nozzle, which converts thermal energy into kinetic energy, and hence provides thrust. The propellant and the heat source are one in the same. Because there is a limited energy release in chemical reactions and because a thermodynamic nozzle is being used to accelerate the combustion gases that do not have the minimum possible molecular weight, there is a limit on the exhaust velocity that can be achieved. The maximum Isp that can be achieved with chemical engines is in the range of 400 to 500 s. So, for example, if we have an Isp of 450 s, and a mission delta-V of 10 km/s (typical for launching into low earth orbit (LEO)), then the mass ratio will be 9.63. The problem here is that most of the vehicle mass is propellant, and due to limitations of the strength of materials, it may be impossible to build such a vehicle to just to ascend into orbit. Early rocket scientists got around this problem by building a rocket in stages, throwing away the structural mass of the lower stages once the propellant was consumed. This effectively allowed higher mass ratios to be achieved, and hence a space mission could be achieved with low-Isp engines. This is what all rockets do today, even the Space Shuttle. In spite of the relatively low Isp, chemical engines do have a relatively high thrust-to-weight ratio (T/W)2. A high T/W (50-75) is necessary for a rocket vehicle to overcome the force of gravity on Earth and accelerate into space. The thrust of the rocket engines must compensate for the weight of the rocket engines, the propellant, the structural mass, and the payload. Although it is not always necessary, a high T/W engine will allow orbital and interplanetary space vehicles to accelerate quickly and reach there destinations in shorter time periods. The heat energy released from the reactor can then be used to heat up a low-molecular weight propellant (such as hydrogen) and then accelerate it through a thermodynamic nozzle in same way that chemical rockets do. This is how nuclear thermal rockets (NTR's) work. There are two main types of NTR's4,5,6: solid core and gas core. Solid-core NTR's (See Figure 2) have a solid reactor core with cooling channels through which the propellant is heated up to high temperatures (2500-3000 K). Although solid NTR's don't operate at temperatures as high as some chemical engines (due to material limitations), they can use pure hydrogen propellant which allows higher Isp's to be achieved (up to 1000 s), since Isp is approximately 1/Mpropellant0.5, where Mpropellant is the molecular weight of the propellant. In gas-core NTR's, the nuclear fuel is in gaseous form and is inter-mixed with the hydrogen propellant. Gas core nuclear rockets (GCNR) can operate at much higher temperatures (5000 - 20000 K)4, and thus achieve much higher Isp's (up to 6000 s). Of course, there is a problem in that some radioactive fission products will end up in the exhaust, but other concepts such as the nuclear light bulb (NLB)4 can contain the uranium plasma within a fused silica vessel that easily transfers heat to a surrounding blanket of propellant. At such high temperatures, whether an open-cycle GCNR, or a closed-cycle NLB, the propellants will dissociate and become partially ionized. In this situation, a standard thermodynamic nozzle must be replaced by a magnetic nozzle which uses magnetic fields to insulate the solid wall from the partially-ionized gaseous exhaust. NTR's give a significant performance improvement over chemical engines, and are desirable for interplanetary missions. It may also be possible that solid core NTR's could be used in a future launch vehicle to supplement or replace chemical engines altogether4. Advances in metallurgy and material science would be required to improve the durability and T/W ratio of NTR's for launch vehicle applications. To convert the reactor heat into electricity, thermoelectric or thermionic devices could be used, but these have low efficiencies and low power to weight ratios. The alternative is to use a thermodynamic cycle with either a liquid metal (sodium, potassium), or a gaseous (helium) working fluid. These thermodynamic cycles can achieve higher efficiencies and power to weight ratios. No matter what type of power converter is used, a heat rejection system is needed, meaning that simple radiators, heat pipes, or liquid-droplet radiators would be required to get rid of the waste heat. Unlike ground-based reactors, space reactors cannot dump the waste heat into a lake or into the air with cooling towers. The electricity from the space nuclear reactor can be used to operate a variety of thrusters. Ion thrusters1,2 use electric fields to accelerate ions to high velocities. In principle, the only limit on the Isp that can be achieved with ion thrusters is the operating voltage and the power supply. Hall thrusters2 use a combination of magnetic fields to ionize the propellant gas and create a net axial electric field which accelerates ions in the thrust direction. MPD thrusters2 use either steady-state or pulsed electromagnetic fields to accelerate plasma (a mixture of ions and electrons) in the thrust direction. To get a high thrust density, ion thrusters typically use xenon, while Hall thrusters and MPD thrusters can operate quite well with argon or hydrogen. Compared with NTR's, NEP systems can achieve much higher Isp's. Their main problem is that they have a low power to weight ratio, a low thrust density, and hence a very low T/W ratio. This is due to the mass of the reactor, the heat rejection system, and the low-pressure operating regime of electrical thrusters. This makes NEP systems unfeasible for launch vehicle applications and mission scenarios where high accelerations are required; however, they can operate successfully in low-gravity environments such as LEO and interplanetary space. 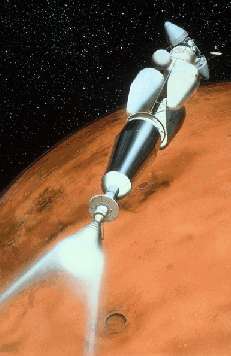 In contrast to a chemical rocket or an NTR which may operate only for several minutes to less than an hour at a time, an NEP system might operate continuously for days, weeks, perhaps even months, as the space vehicle slowly accelerates to meet its mission delta-V. An NEP system is well suited for unmanned cargo missions between the Earth, Moon and other planets. For manned missions to the outer planets, there would be a close competition between gas-core NTR's and high-thrust NEP systems. So how do nuclear propulsion systems stack up against chemical systems for a particular space mission? Table 2 shows the results for a Mars mission comparing a high-performance chemical system (H2/O2) with a solid core NTR operating with hydrogen propellant. The payload mass is 100 tonnes and the round-trip travel time is 1 year (6 months to Mars, 6 months return to Earth). The structural mass fraction e is assumed to be 0.05 for the chemical system, and 0.1 for NTR system, to account for the extra mass associated with the reactor and shielding1. The final results are striking. The chemical system has a payload fraction of about 17%, while the NTR system is 40%. More than three times as much propellant is needed for the chemical system. This will translate directly into higher mission costs since all the propellant must be launched into orbit. If we assume that it costs about $5000 per kg to put hardware and propellant into orbit, the chemical system will cost at least 3 billion dollars, while the NTR system would cost about 1.3 billion dollars. So, on the basis of launch costs, one could have two nuclear missions for the price of one chemical mission. Indeed, nuclear propulsion gets "more miles per gallon". In the realm of NTR technology, the U.S. had made significant progress in the period of 1955-1973 with the Rover and NERVA programs4,5,6. Over 20 full-scale reactors were built and tested, and met the performance requirements for various space missions, including the use of NTR's for the upper stage of a launch vehicle, such as the Titan-III or the Saturn. Due to down-sizing in the 1970's, the NERVA program was cancelled before any flight tests could be performed. The advent of the Strategic Defence Initiative (SDI)6 in 1983, and later the Space Exploration Initiative (SEI)6 in 1990 had renewed the interest in nuclear propulsion (both NTR and NEP), and extensive R&D began at various universities, government labs, and aerospace companies; however, Congress indefinitely shelved these programs in 1992, and only a small level of research has been carried out since. Like the U.S., the Russians built and ground-tested several NTR engine designs, operating on a variety of propellants, including hydrogen, ammonia, and alcohol. Although their work continued relatively steadily up until the mid-1980s, there is no evidence yet to confirm whether or not the Russians actually flight-tested any of these engines. In contrast, electric propulsion technology has been developing steadily since the 1950s. Ion and Hall-type thruster technology have matured to the point that they are now being used on operational commercial and military satellites with photo-voltaic power sources. MPD thruster technology is still under development, although many systems have flown on test satellites. For the purpose of maintaining a satellite's orbit, the solar-electric propulsion system is quite adequate. "In conclusion then, the navigation of interplanetary space depends for its solution on the problem of atomic disintegration... Thus, something impossible will probably be accomplished through something else which has always been held equally impossible, but which remains so no longer". Hill, P. and Peterson, C., Mechanics and Thermodynamics of Propulsion, 2nd Edition, Addison Wesley, Reading, Massachusetts, 1992. Sutton, G., Rocket Propulsion Elements, 6th Edition, John Wiley and Sons, New York, 1992. Lamarsh, J.R., Introduction to Nuclear Engineering, 2nd Edition, Addison-Wesley, Reading, Massachusetts, 1983. Clark, J.S., An Historical Collection of Papers on Nuclear Thermal Propulsion, AIAA, Washington, D.C., 1992. El-Genk, M.S., A Critical Review of Space Nuclear Power and Propulsion 1984-1993, AIP Press, New York, 1994. Pike, J. , Nuclear Thermal Propulsion, http://www.fas.org/nuke/space/index.html, World Wide Web, 1998. Campbell, W.E. et al., "NPSP Selection for A Nuclear Rocket", Paper 67-476, Collection of Technical Papers on Nuclear Propulsion, AIAA 3rd Propulsion Joint Specialist Conference, Washington D.C., 1967. Ragheb, M., NucE/ME 302 Nuclear Power Engineering, Fall 1998, http://www.staff.uiuc.edu/~m-ragheb/NucE302/index.htm, World Wide Web, 1998.